Note: By default, no widgets are included in the pre-defined editor presets that you can get from the CKEditor Download site. If you want to add a widget to your CKEditor installation, read the instructions and use CKEditor Builder to add them to your build. Widgets are the main feature that CKEditor 4.3 introduces. As explained in the beta release post, widgets are special rich content units in that they are groups of elements which are treated as a single entity inside the editor. Widgets as delivered in CKEditor 4.3 are not just a theoretical concept -- we are now also introducing some widget plugins that you can download and use with this editor version, taking advantage of the possibilities that have not been available before. Take for example the Mathematical Formulas widget that you can use to create or modify mathematical equations using TeX. Another one is the Enhanced Image plugin that introduces image captions -- something that used to be impossible in the editor using the default Image plugin. One of the features that was absent in the Enhanced Image prototype was file browser integration. No such issues this time -- this has just been added, so you can use the captioned image widget along with your CKFinder instance or another file browser of your choice. The new Mathematical Formulas widget now has a loading indicator which will show the user that the widget is not inactive and the equations will be displayed in a moment. The need for the introduction of the Widget System was confirmed almost immediately when our development team faced some recent issues with the Placeholder plugin. Interestingly enough, it turned out that this is a perfect use case for widgets -- and so the Placeholder plugin was now completely rewritten as a widget! It would be difficult to list the numerous improvements that were introduced to the widget system after the beta version was released, both in the UI, overall handling, and under the hood. Widgets are now better integrated with other editor features and plugins, but also easier to integrate with external systems (for example other dialogs). We have been working a lot on the major widget feature which is drag and drop, fixing lots of edge cases, but also introducing the option to disable dragging if needed. Overall we feel the Widget System is now really mature and are very excited to be able to deliver it to the general public! The blog post introducing CKEditor 4.3 Beta with an introduction into widgets, explaining why this new feature is exactly the thing you have been waiting for. The Introduction to Widgets article of the Developer's Guide. The Widget SDK section of the Developer's Guide with our widget tutorials that are a must-read for anyone who wants to create their own widgets. The widget samples available in your CKEditor installation package after you add plugins like Enhanced Image or Mathematical Formulas to your build. The widgets demo on our website. CKEditor 4.3 introduces compatibility with Internet Explorer 11 immediately after its release. Check how the editor performs in the latest version of the flagship Microsoft browser! 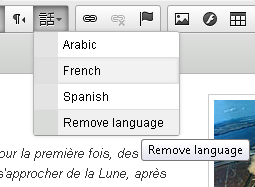 The Language plugin that implements the Language toolbar button to support WCAG 3.1.2 Language of Parts. It lets you mark the language of content that you are creating which ensures that user agents can correctly present content written in multiple languages. New Smileys that go along nicely with the Moono skin. New config.dialog_noConfirmCancel configuration option that eliminates the need to confirm closing of a dialog window when the user changed any of its fields. We are really enthusiastic about the new CKEditor version and in particular, about the Widget System feature. The 4.3 Beta brought us a lot of positive feedback, both online and on September's Drupalcon, so we will be happy to hear from you and thankful for any suggestions that will help us improve this feature and tailor it to your expectations. Please use the CKEditor Development site to report issues and suggestions through tickets.